Date Added: Wednesday 11 November, 2009 by Hugh G.
I am thoroughly impressed with my cardigan and with Magnoli in general! There was a mistake with the first one (wrong colour and size), however I emailed Indy and got a same day response apologising for the mix-up and how to go about making sure I got what I was after. The new one arrived and is not only the right colour but probably the best fitting garment I have ever purchased. Workmanship and fabric quality is superb. 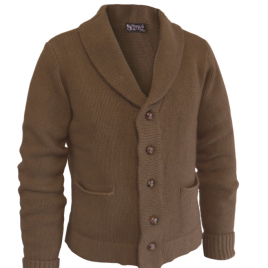 A wonderfully thick, warm material and thanks to the cashmere as smooth as silk. Buttons are real leather done in true vintage style, not some cheap plastic imitation. Fantastic value for money, but what has really inspired me is the level of customer service. The ultimate test of a business is how it responds when something goes wrong; Magnoli and Indy have passed with flying colours and that's a damn rare thing these days! I'll be purchasing a lot more from Magnoli in the future.. Date Added: Tuesday 10 November, 2009 by Andrea D.
This magnific cardigan is not only very screen accurate to \'The Mystery of the Blues\', is the best knitwear I ever saw! Greatest Magnoli quality as alway! Thanks again Indy.. Date Added: Friday 06 November, 2009 by Peter M.